Great grandmother's hope chest holds beautiful old clothes and photographs. As a genealogist we love to learn about them but wish she would have added names and stories. If older relatives are unable to help us, do not lose hope. We can discover more about these items by learning the history of the clothing styles; this will help us date the photographs. When looking at the styles of clothing and the purposes for them, be it a fancy gown worn at a wedding or a day dress, there are a few places to look that can help you gain an approximate era for the clothing. Knowing this era, helps you link special events which happened during this time your family's story. Ladies' styles of the 1790s - 1820s were 'Empire' dresses, having a high waist line and a pleated skirt which was fuller in the back than the front. At the center front of the skirt, there was a special tuck designed to raise the skirt over the toes. The sleeves on the dresses formed the shoulders and were fitted down the arms. The French influenced the styles in the American colonies during that era. Dresses changed to a natural waistline with a narrow waistband. They were corseted, creating the illusion of a small waistline. Many layers of heavy, stiff petticoats were used, as the hoop skirt was not invented at this time. Hem lengths stopped at the ankle. The sleeves had dropped shoulders and until 1836, gigot sleeves were in style. Gigot sleeves were full above the elbow and fitted to the wrist. After 1836, the sleeves were full to the wrist and the hem stopped at the instep. Wearing many petticoats not only made the clothing heavy, it was also extremely hot. The bodices of this era covered the woman and had tucks at the shoulders. They were pleated at the V-shaped waist in order to create a visual line of a small waist. These dresses had fitted sleeves. 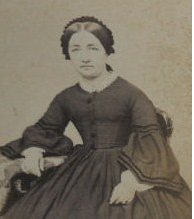 In the late 1840s and early 1850s a 'round' dress became popular. A 'round' dress was created by way of a blouse with a drop shouldered yoke. It was worn with a slim top sleeve which extended into a slightly wider sleeve and buttoned at the wrist. A 'round' dress was worn with an under sleeve and the bodice had a fan type shape at the waist. The blouse and skirt were attached onto the same waistband. The 1850s introduced the hoop skirt. In 1855 it was designed to eliminate the need for all the heavy stiff petticoats worn previously. However, it was unfashionable for the hoop lines to show on the skirt, therefore, some layers of petticoats were still worn. Matching fabric was used for both the bodice and the skirt. The day bodice was close to the neck and usually gathered and tucked in at the waistband of the skirt. The skirt would have been very full and either gathered or pleated into the waistband. There were two styles of sleeves during this time period. One style dropped of the shoulder and was lightly gathered at the seam. These were not as full as the 1840s. They were either gathered or buttoned at the wrist. The second sleeve style, in the late 1850s, was called 'pagoda.' This style began off the shoulder and became quite full. These sleeves hung loose near the wrist and an under sleeve was always worn. Both styles were popular until 1862. Worth mentioning here is the 1850s 'wrapper.' This usually was thought to be a robe; however, it was also worn as a work-dress. This style has been seen in tintypes. It was similar to the 'round' dress of the 1840s. It had buttons down the entire front of the dress but did not have a waistband. The Garibaldi blouse became popular with a wide waist belt which was either straight or shaped. It was worn with the full hooped skirts of the later 1850s. This blouse was fitted and it buttoned up the front to the neck. It was popular to adorn the edges of the buttoned front, sometimes with an overlapping decoration at the neck. The shoulders continued to be dropped sleeves and this style blouse had a full gathering at the top of the sleeve as well as being gathered into a narrow cuff at the wrist. The 1860s ball gowns we see so often were usually photographs of the bride on her wedding day. These pictures included the bride only. The purpose of the photograph was for the husband to carry her picture with him wherever he traveled. The styles of the bodices were very snug and fitted. They had short sleeves and, at times, bared the top of the shoulders. During the late 1850s and early 1860s the 'pagoda' sleeve was very popular on ball gowns. The bodices generally had a deep V-waist with a very full hoop skirt over layers of stiff petticoats. During this era the 'princess' style came into fashion, and gone were the bell shaped antebellum skirts. The skirts of this time period moved the gathers from the antebellum skirts to the back which began the bustle era. Straight long sleeves attached to the bodice at the edge of the shoulder. Only ball gowns would show the top of the shoulders. Dresses worn during the day covered to the neck and were decorated with ruffles, pleats or lace. Long fitted jackets were popular. During the 1880s, the hourglass silhouette became fashionable. The blouse had darts to the waist and natural sleeves typically ended at or just below the elbow. The common sleeve styles were slightly fitted or lightly gathered to the wrist. A square neckline was popular, and covered by lace or fabric during the day. The skirt had darts fitted at the waist and a bustle effect was created by a gathering of the top of the skirt. Another popular skirt was darted in the front with heavy gathers in the back, again, creating the bustle effect. Circular skirts were popular which were smoothed to a waist band without pleats or gathers. Some skirts would have darts in the back with the bustle. The blouses tucked and gathered into the waist. 'Bishop' sleeves, which began at the top edge of the shoulders, had either gathers and full to the wrist or were very full to the elbow and snug to the wrist. The bodices were covered to the neck and sometimes had a rounded yoke, gathered or smocked. It is important to understand the clothing changes for different religions as well as areas of the country. Basic styles seen in photographs and paintings would typically be their best or favorite dress. Some religions allowed ladies' dresses to reflect the overall style of the time period, but would exclude additional trims and decorations. 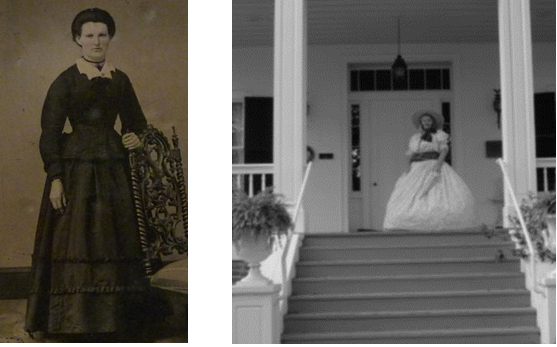 During the 20th century, being dressed as a character or in period clothing was not uncommon. Look closely at the photograph in order to tell if there are other clues which lead you to question if this is an older photograph which fits into what was the usual style of the era or a time-period-inspired photograph containing other items that lead you to suspect they are not period correct. Once you know the styles worn during each historical era, you can identify the time period of the photograph, portrait, or actual garment of your ancestor. Review this photograph and use the information learned to discern if this is an era photograph or a time period picture. First, let us look at the skirt. Although you cannot see the full skirt, we are able to tell it has a very full, gathered skirt from her waistline. We know this gown was popular in the 19th century. As we look at her sleeves and neckline, we have learned this was popular in the late 1850s or early 1860s. We also see it is a young lady photographed alone. Using the details we have gathered from the picture, we can surmise she was photographed on her wedding day. If we look at the family group sheet, we see that your 3rd great grandmother was married in 1859. The photo, itself, is not conclusive evidence, since her name was not written on the back, but it does help us place the young lady in a particular era so further research can be done. Start using the photographs, portraits, and clothing you find in history as a tool. This will enable you to add more to the story of your family history. When looking at their clothing, first look at the skirt asking where the style of skirt fits in the time period. This can quickly narrow down the photo to a specific century. Then, look at the sleeves and neckline. It will help you narrow the time period even further. By using all of the details learned, you will be able to open your great grandmother's hope chest and have the pictures and other items tell their own stories.